Award ceremony at Montbazon 2012. Partisan from Russia are in the red and yellow. I first discovered the world of full contact fighting on YouTube. Someone sent me a link to the first Battle of the Nations event at Khotin Fortress in the Ukraine in 2010. I was astonished. I was a reenactor with 20 years experience of display fighting and a few of doing HEMA/WMA. To watch guys fighting in a way that looked so real, violent, and FUN was incredible. I knew I wanted to do this. 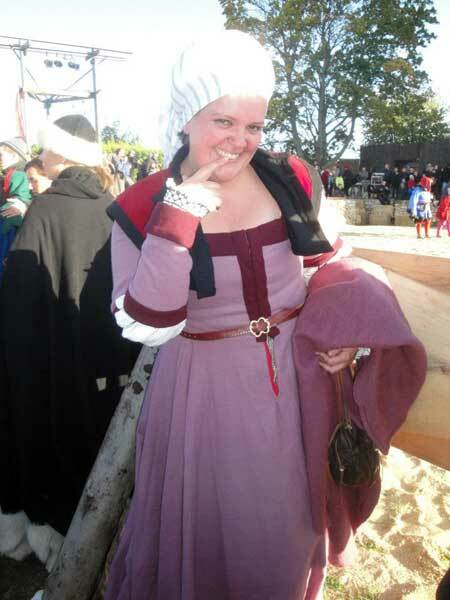 I sent links to all my reenactor friends and said, “We should do this!” Virtually every one of them thought I was mad. Two years down the line I found a few people on Facebook who thought that it might be interesting and we formed a group. None of us had any experience in full contact, some did not even have experience of tournament 1-on-1 fighting, just battlefield which is very different and restricted. 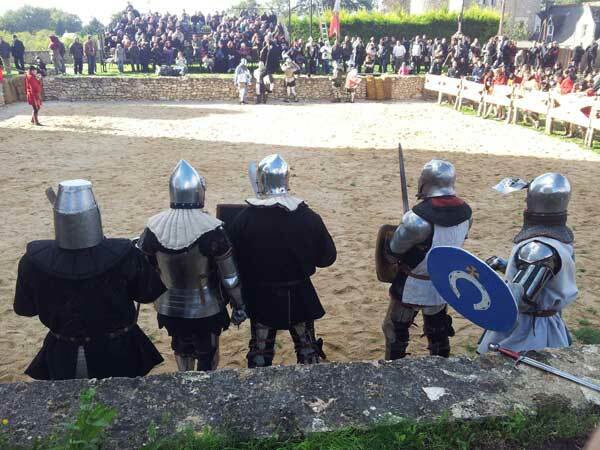 Some French guys found our page and invited us to the Grand Tournois de Faucon Noir (the Grand Tournament of the Black Falcon) in Montbazon just south of Tours. It was just under 1 year away. Of the 10 or so people on the Facebook group, I was the only one who had seriously expressed interest in going. But I still had no equipment and was unsure about my financial capability to buy new kit, or even get the time and money to attend. I had never attended an international event with attendant language differences, and I was at this stage looking like I was going alone. So Jean-Philippe in France was always in contact pushing and giving me videos, links to armourers and suggestions as to who the guys in France were using. He and I developed a good natured banter based on the ancient rivalries of France vs England. By late July I had committed to go. My wife had become sick of me talking about it and challenged me to put up or shut up. So I filled in the application form and sent it off. I started to speak to an armourer in Poland and placed my order and sent off the deposit on September 1st with his promise my kit would be ready and in my hands in time. True to his word everything arrived, arms, legs and helmet, on October 20th with one week to spare before I was due to set off. I had managed to source a hardened back and breastplate from Ebay and I was going to go with my trusty old shoulders and gauntlets from the set I had worn for close to 20 years. The one thing I had not done was put it all on and get hit! So on Thursday evening, the day before I was head to France I went to training, put it all on (including cutting holes in the straps at the right places) and handed my sword to a friend. Raising my arms I told him to wind up and hit me in the chest as hard as he could. He did so and I barely felt a thing! The hardened breastplate had a small dent, but suddenly I was feeling a LOT more confident. Next, I handed him my shield and told him to punch me in the faceplate of my visor. We danced around for a few seconds simulating the fact that I would not just be standing there when someone punched me, and then in it came. I thought I had broken my jaw! The bottom of my visor was barely touching my chin, yet when punched it was transferring all the force to the back of my jaw and into my skull! With a day to go I had no time to sort the problem so I just had to put a fraction more padding in and make sure that I dodged any shield blows! My trip to France was to be by train. I had to lug a backpack of sleeping gear and change of clothes plus a 40kg Samsonite suitcase on wheels on the train from Reading to London, across London on the Tube to Kings Cross St Pancras, then Eurostar to Paris, across the Paris Metro from Gare du Nord to Montparnasse-Bienvenue, and last the TGV to Tours. Never again. For a start my kit was too heavy and in a 6kg (empty weight) suitcase. The Paris Metro has no escalators so I had to carry it up and down every flight of stairs. It was hell. Fortunately at Tours I was meeting an old friend from Australia who had recently moved to France and had driven 3hrs to pick me up and take me to Montbazon. Kat was a godsend for this weekend. She was our squire, helping us get equipment on and off. She brought food and water to us while we were at the arena side, never sure when we were to be called to fight, and she even shared here nice and warm hotel room with me on the second night because none of us were prepared for how cold it would be sleeping on a wooden floor of a marquis tent on the top of a hill in the middle of France in late October! I cannot thank her enough! Kat is a longtime friend from Australia who recently moved to France. She drove 3hrs from her house in the Vendee to help out the team. A few months before, on my registration I had been asked if I had a preference for which team I joined. All I knew at this stage was that one of the Team USA guys from their debut at Battle of the Nations earlier that year was to be there and he and I would be in the same team. A week before I set off Jean-Philippe told me that 4 other guys from England were coming which was news to me as nobody had mentioned anything on Facebook. When I arrived in Montbazon I was introduced to my team mates. Nikolaj, Evgeny and his brother Aleksey had brought their car down from London with their wives and girlfriends. These guys had been living in London for over a year now and each of them had been fighting for years in Lithuania, Belarus and Poland. Lukas had actually met me at Tours train station and come down with Kat and I. He was a Polish fitness trainer now living in London and had some experience in the polish league as well. The experience these guys brought to our team was invaluable. Two Spanish fighters, Cristian and L’Enrique, had also turned up and needed a team. We needed reserves so they were drafted and became honourary Brits for the weekend. Together we all formed the first ever appearance of Team UK. Which was amusing since it was made up of an Australian, a Pole, 3 Lithuanians and 2 Spaniards. A true London cosmopolitan team! Incidentally this team went on to compete as Team one in Battle of the Nations 2013 and reach the quarter finals on our debut. Our Spanish brothers went on to form a Spanish national team with Cristian as the team captain. We met a few of the other teams who were to be our competition. Belgium had sent a team which had a giant of a man called Sylvain, who stood at 6’7” tall, and his girlfriend who also fought who was a blacksmiths apprentice. France had sent 3 teams, Germany had sent two teams and Russia had sent their number 1 5v5 team… the current world champions. 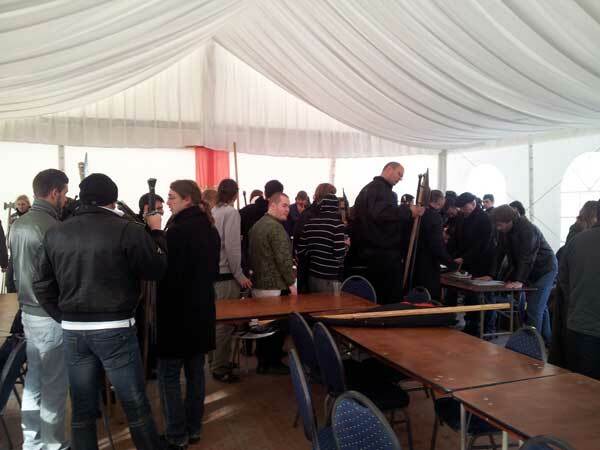 The morning of the tournament everyone lined up to sign the release papers and have all weapons checked for weight, length and edges. I must say that now after several international tournaments, this is the best event for this activity, and some do not event check at all except as you are stepping onto the arena floor. Everybody lining up for weapons check. You can see Sylvain the giant Belgian easily. An hour or so later we all marshalled up beside the lists at the base of the keep. Fortresse Montbazon is built on a steep hill at the end of a ridgeline that points into the centre of the town and its earliest elements date back to 991AD. 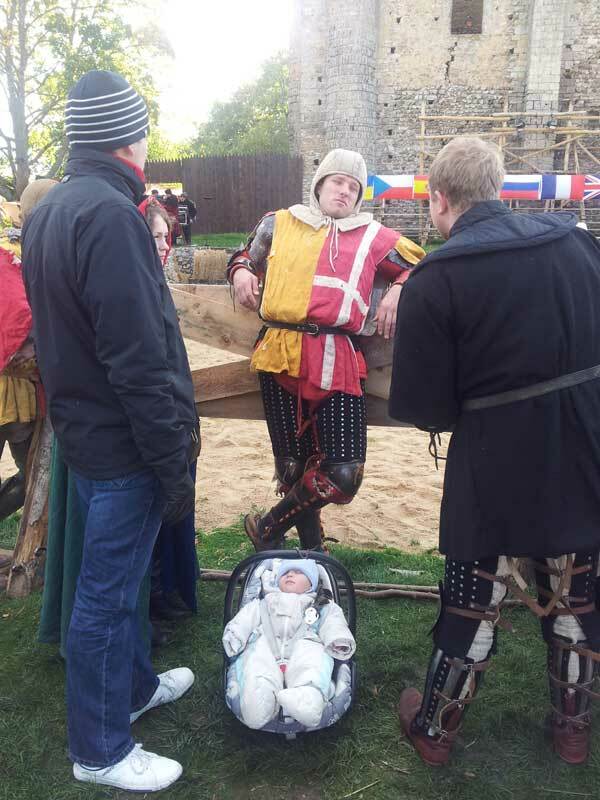 It is said that in September of 1356 the Black Prince spent a night at the castle. Inside is a square keep that was preserved in the years after the war by an ex-pat Englishman but he was only able to shore up the outer shell of the keep. Perched on top is a 9.5m bronze statue of the Virgin Mary installed in 1866 and funded by the Empress Eugénie, wife of Napoleon III. 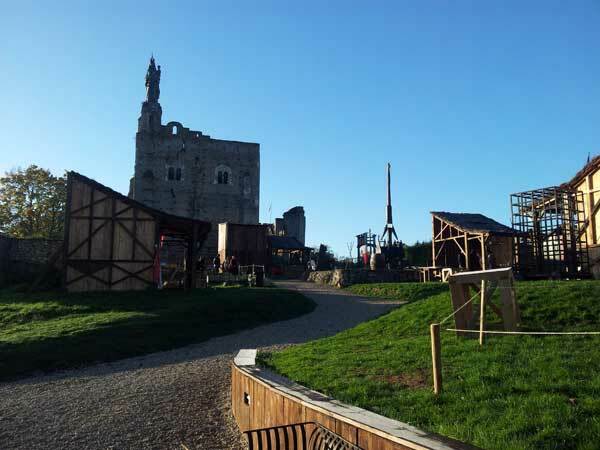 The arena is bounded on 3 sides by a stone retaining wall approximately 1.2m high and on the remaining side by a very sturdy wooden barrier made from rough sawn cuttings from a local sawmill. Rough sand covers the floor to a depth of about 8-12cm. I remember the nervous feeling I had after donning my harness and standing waiting to be called. I do remember that the first fight of our first round I was held in reserve, one of our Spanish brothers taking the 5th position. He too was having his first ever experience of full contact fighting. The second round and I was called in to rest Cristian. I locked my visor down and was told by Nikolaj that my job was to hold the centre. Occupy one, if not two fighters while they took the team apart at the flanks. A common rule of combat is the plan does not outlast contact with the enemy. As you can see from the video below it was Franklands (who later became Martel, France’s current top team – please forgive the vertical format of the video, it was taken by a friend). I am in the full steel harness without tabard, carrying the white shield. I look back at this video and see so many things I did wrong. I relied too much on my sword, I was not hitting hard enough by a long shot and I was generous in allowing JP to go and collect another weapon instead of engaging him while he could not respond. When Lukas had his opponent up against the back wall I should have been attacking his legs or trying to pull him over instead of just uselessly hitting him in the head. Finally JP comes over and hangs off my neck until he pulls me over. Regardless, we won! Over the course of the day we continued to fight when called. Each fight I became more proficient, learning from my mistakes. Each time we fought we helped our opponents up, and left the arena only to hunt out the people we had defeated, or who had thrown us to the ground to excitedly relive the battle. You can see the layout of the lists. The Keep is to our left out of shot. Team UK have their backs to shot. In order they are Nikolaj, myself, Evgeny, Aleksej and Lukas. One thing that was immediately obvious; the Russian team were in a class of their own. Over the entire day only two teams managed to even get one Russian on the floor; Franklands and us. Every other fight they won 5-0. My most memorable moment of the day comes from rushing in against Artyom, the only Russian I knew by name, because I had been watching videos of him for 2 years. I knew he had an evil shield jab so I ran in with both shield and weapon up intending to try and grapple him. He is much bigger and stronger than me, so my plan was to simply hang on like a limpet and restrict his movement until one of my companions could come to my aid. To put it bluntly, I failed. He managed to pick the 2 inch gap between my guard and levelled a punch to my faceplate that sent me flying backwards. I remember the concussion and the next thing I know is I am lying on the sand looking up through my visor at the Virgin Mary outlined by a perfect clear blue sky. I do not think I have ever been punched that hard in my life, nor have been since. Later I sought him out and had one of his companions translate for me the fact that he had punched me so hard that one of my knee plate articulations had popped out of alignment! By the end of the day we were told that we had won enough bouts and scored enough points that we did not have to fight the final round of combat. We had come second behind the world champions on our debut! In my firm opinion this was due to the experience of my team mates. 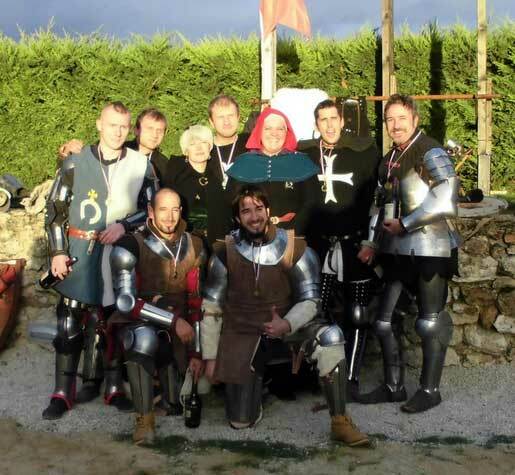 For many of us, this was our first ever full contact tournament and the strength and experience of my companions was a great advantage and still is to this day. During the evening there was a great deal of merriment. People moved between the tables and drank to the health of their foes. The only two people injured that day returned from the local hospital. One had dislocated his knee when someone fell on him, and Sylvain the giant had dislocated his shoulder and fractured the ball. Someone jokingly told him it was not from a solid hit, but from him taking two big falls from the stratosphere. The following day was the single combat tournament. Once again I was a rank novice at this. I had been doing “sword fighting” for around 20 years, but this was the first time it was truly competitive. I had no real idea of what to expect and I was to be one of the first pairs to meet. My first opponent was a Frenchman called Ronan “the barbarian”. He was older even than me (I was 42 at this stage) and a good deal heavier, but apparently he was a boxer. We were called to lay on and suddenly I was in the centre of a whirlwind. Ronan just went in with a non-stop hail of left and right combinations. So as this was a points scoring competition, not a takedown event, I thought I had no option but to try and match him. This was where I learnt my next lesson in full contact fighting; cardio is king. Within no time at all I was exhausted. My arms felt like lead and I was barely able to breath inside my helmet. 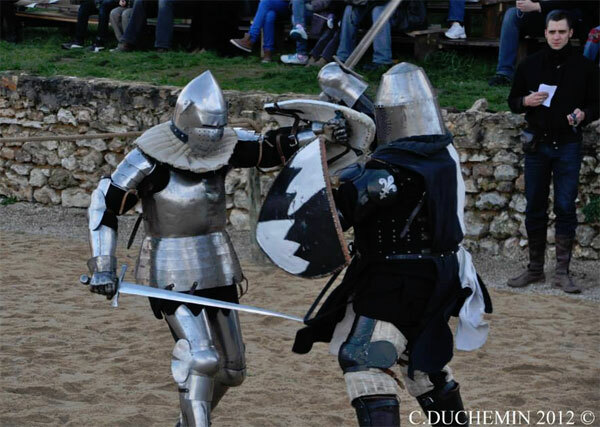 Myself, on the left, fighting Ronan from France. It was a brutal lesson in the need to vastly improve my cardio and general fitness. Although in my eyes I had put in my most dismal showing of the weekend I had no option but to concede to him. As I staggered from the list I realised I could not do any more of these fights today so I withdrew from the competition. I spent the rest of the day watching from the sidelines and trying to learn as much about this experience as I could. After three of four more rounds I quickly realised I had made a mistake in telling the organisers I would withdraw. Not all fighters were like Ronan. The smart fighters played a much more tactical game akin to chess. Keeping their distance and making lightning strikes of opportunity. By the time Ronan had completed his 3rd bout, he too was exhausted and unable to continue. Aleksej, Nikolaj and Evgeny were almost unstoppable and in the end Aleksej met in the semi-final against one of the Russian singles experts only to lose by the narrowest of margins. In the end, our team came home with 2nd place in the 5v5 bohurt class and a 3rd place in the singles. But even better we had formed a strong bond and the foundation of Battle Heritage. I am still in contact with many of the fighters from that day and am proud to call them friends. We even manage to meet up a few times a year and beat seven bells out of each other in friendly, yet spirited competition that allows us the opportunity to later sit around a table and trade “war stories” and compare bruises. In discovering this sport I have discovered a new brotherhood of like-minded people from all corners of the globe. I enjoyed re-enactment and still do so, but the thrill of being able to let loose in the lists and the new friends I have made in so many different countries has elevated this sport to one of the most enjoyable experiences of my life. bohurt, Faucon Noir, Montbazon, tournament report. Bookmark.